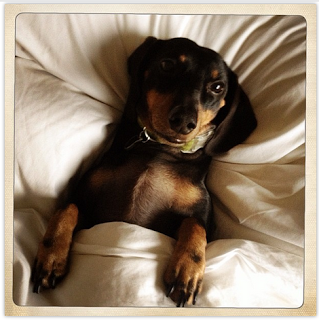 Heather's Perfect Posts: My Story for Sleep Tight, Angus! He saw bones everywhere! "Where am I?" Angus asked. He looked up in the sky and there was the ruler of the island! "You are in Bonny Land," replied Cooper the Ruler of the Land, "Follow me. I am going to lead you to the palace of bones." Thought he was in trouble! "W-what pal-lace?" Angus said. Cooper said nothing, and walked through the clouds and Angus followed. When Angus saw the palace, he was no longer scared! He froze. He was also speechless. After a few moments, Angus said, "Wow! I must be in heaven!" Angus burst into the palace and shouted, "I'm Angus!" No one replied. "Hello?" Angus tried again and again until he gave up. Right when he wanted to walk out the door, a servant came out with a bowl of bone-shaped dog treats. "Welcome to Big Bone Palace. Is there something I can help you with?" Angus didn't know what to say. "Ummm... I guess. Can you give me a tour around the palace?" "Yes," the servant replied, "First of all, I am the head of all of the servants. My name is Rocky. I am known for giving out treats. Would you lik-" Angus interrupted, "Yes, I would love a treat! Actually, would you be kind enough for five treats?" Angus was a little greedy. "Of course," Rocky said politely, "Have as many as you want." After Angus was finished with his delightful treat, he yawned. "I'm tired. Would you excuse me for a nap?" Angus complained. Angus could tell that Rocky was getting kind of impatient. "Wake up! Wake up!" Rocky yelled. Angus was confused. "Where am I?" he asked. "Remember? You are in one of the royal rooms of Big Bone Palace!" Now Rocky was really getting impatient. "Is it time for my tour around the palace?" whined Angus. "Yes," Rocky said in a grumpy voice, "We are going to meet the Queen Edoggybeth and King Georgedog" That suddenly put Rocky in a fabulous mood! When they got to the room, they weren't there! They were so astonished! "But... I called them," Rocky cried. What Rocky didn't tell Angus is that they didn't answer. "They must be in trouble!" Angus worried. They thought for a moment and then Rocky suggested, "Let's ask Cooper!" They rapidly ran on four legs and they almost trampled each other trying to get out the door! Rocky and Angus finally made it out the door with two big holes in the door. They had broken the door! "We don't have time to fix the door now. We'll do that when Queen Edoggybeth and King Gorgedog return," Angus said, but Rocky didn't seem too worried ether. "Cooper ! Cooper !" Angus and Rocky shouted together. "What can I help you with?" Cooper exclaimed. "Queen Edoggybeth and King Georgedog are missing!" Angus said sadly. "We have to help them! They may be in big trouble!" Rocky shouted very sadly. Cooper's mouth dropped about five feet long. "Are you kidding me? I thought they were safely in the palace! I honestly do not know what happened to them. Are you sure that they are missing?" Cooper said out loud. Angus and Rocky said together, "We are absolutely sure! This is not a joke. This is serious." They scouted the jungle and found a place called Country Jail. "Why would they be in there? They didn't do any thing wrong. Plus, they are the Queen and King!" Rocky explained. "Let's check anyways. It's better to be safe than sorry!" Cooper said back. When the three checked, they weren't there. "Look! Footprints! They must be from Queen Edoggybeth and King Georgedog!" Angus said excited. All three of the dogs followed the footprints and guess what is leaded to? The LIBRARY! "How could they be in the library?" all three dogs asked their selfs. They searched anyways. "Nope, not here." thought the dogs. "Do you think Queen Edoggybeth and King Georgedog are in a obvious place, but we just haven't noticed?" asked Rocky. "That's possible," said Cooper, "What are the possible places can you think of?" They thought for a long time, but finally, they thought of these places: Behind Big Bone Palace, to the east of Big Bone Palace, to the west of Big Bone Palace, in another room in the palace, and the doggy park they always go to. "Why don't we just go home for now and check the rooms in our palace?" explained Rocky. "Sure," Cooper and Angus agreed. Angus and Rocky rode Cooper's back and went back to Big Bone Palace. When they were finally there, they looked at tthe obvious places that they thought of starting from the rooms. Queen Edoggybeth and King Georgedog were not anywhere near the palace, so they went to the doggy park. They weren't there ether. They were about to give up for the day, when they heard a call. "Help" it cried. They sounded exactly like Queen Edoggybeth and King Georgedog. "We will help!" Angus called back, "Just tell us where you are!" The cry came back. "We are in your school!" barked the dog. We dashed into the school and made a call. "Queen Edoggybeth and King Georgedog, please come to the Principal Doggyjone's office. Thank you," Cooper said on the speakers. They came, and Rocky told them their story. King Georgedog told their story and all of them laughed all the way back to the palace. All of a sudden, Angus woke up! Does your pet do anything human-like things? Do you ever learn anything the hard way? As they happy pack of dogs was walking home Cooper noticed that the queen and king were gone, again! They searched and searched but the king and queen were simply gone. They did not think much of it. Angus said "They were gone once and we found them. What's the difference if they are gone twice, won't we find them again?" They all agreed. Rocky said " They are probably at the castle playing a joke on us." Since it was late at night, they all went back to the castle and fell asleep. The next morning, the king and queen were still missing. Rocky said "We will just have to call in a new king and queen." The replacements would be Cooper as the king and his wife, Mika as the queen. They also had two daughters. Those two daughters would be the princesses. The older one was Pokie, and the younger one is Rory. They soon arrived at the castle, happy as could be. Angus said" I shall not let anything happen to this wonderful man Cooper and his family, who led me into this joyful land." Rocky replied" Cooper is the best friend I have ever had and I will NOT let anything happen to anyone who is related to him or very close to him." Can you continue the never ending story?